Is Markovic the right man to sort out Arsenals frontline. | The Transfer Tavern | Where football transfer rumours fly or die! When Arsenal’s talismanic striker and goal machine, Robin Van Persie, announced his decision to leave the gunners in the summer, manager Arsene Wenger was once again left with the almighty task of rebuilding his teams attacking line up. 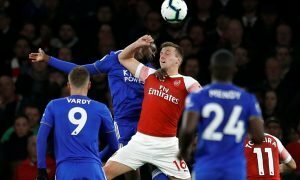 The Arsenal boss dusted off his cheque book to sign quality forwards Lukas Podolski and Olivier Giroud but things just haven’t quite gelled for the gunners frontline this season as the void of Van Persie is still lingering at The Emirates. Giroud and Podolski have been hit and miss so far in what has been a patchy start to Arsenal’s season as Wenger’s side has really struggled at times to open teams up and create the number of chances we are used to seeing from the gunners. Perhaps this indifferent form is the result of a transition period that the team are still getting to grips with or it could simply be down to the poor form of some of the attackers. Maybe this is why Wenger already has his eye on a new front-man and is ready to wade into a transfer tussle for the 18-year-old Serbian striker Lazar Markovic in January (link). The teenage forward already has five senior caps for Serbia and has really caught the eye this season in the Europa League for Partizan Belgrade where he has attracted the attentions of Inter Milan as well. It’s easy to see why Markovic has become the centre of a transfer storm around Europe as with great speed, superb control and composure in front of goal he as all of the necessary talents to become a real star in a few years time. Markovic seems tailor made to fit into Arsenal’s style and perhaps that is why Wenger sees him as an important acquisition for the gunners looking to the future. However, shouldn’t Wenger be looking at improving his sides situation in the here and now? It’s seven years since Arsenal last won a trophy and some fans are beginning to grow impatient with the lack immediacy in the managers plans. If Arsenal want to sort out there goalscoring problems sooner rather than later then they need to sign a proven world class goalscorer that is more than capable of fill the empty boots of Robin Van Persie. Wenger should be looking at players like Huntelaar and Falcao rather than focusing on finding a potential star in the making. We all know the Arsenal boss doesn’t like to spend money but surely he has to see that something needs to be done to get the gunners firing on all cylinders again. Lazar Markovic is definitely a talent for Wenger to keep his eye on, but the young Serb should not be his priority. Chances are that Markovic will choose his dream move to Chelsea over Arsenal anyway, so it’s time for Arsene to move on and look at some proven talents to sort his team out.